Malone’s study of the impact of Henrik Ibsen on the literature of the Irish Revival highlights some of the main themes of a major literary movement during the full flowering of Ireland’s national identity at the turn of the twentieth century. Irish authors of that time, struggling to bring about a rebirth of language through Gaelic imagery, cadence, and music, were keen to inject folkloric quality into the popular drama of the Dublin stage experience. Irish theatre had been locked for some time in British style musical comedy favored by the upper classes. A high point in this Irish cultural revival was the Abbey Theatre. The theatre opened in 1904 and offered a venue for performances of the works of a number of Irish dramatists, including Lady Gregory, W. B. Yeats, J. M. Synge, and Seán O’Casey. The cultural whirlpool of the time was whipped up by the realization of home rule and the subsequent political events that followed. These historical milestones shaped the development of a distinctly Irish national consciousness. Its evolution was felt in every aspect of Irish culture. The writers, more than other Irish artists, were pushed to negotiate a sometimes precarious path between the conflicting demands of modernism and tradition, nationalism and cosmopolitanism. 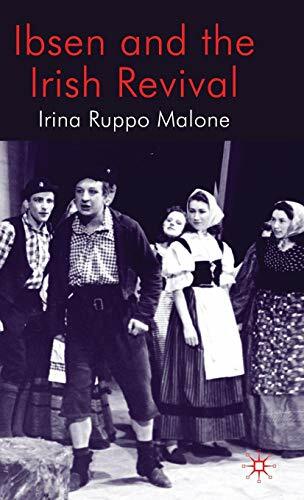 For the most part, Malone’s book seems a courageous attempt to fish out the threads of these conflicting -isms in order to bring out what kind of influence Ibsen’s Norwegian “realism” (and its overlay of raw emotion) had on Irish audiences. Malone challenges the accepted view that the Irish Revival was rooted in, among other things, a rejection of the seemingly ambiguous moral codes represented by Ibsen. She quotes writers and critics of the time to illustrate her argument that wider exposure to Ibsen’s ideas fostered not blind idealism, but a cross-pollination resulting in a self-reflexive, humanistic version of modernism. Part of the rising Irish humanism that benefitted from Ibsen’s viewpoint was the introduction of new attitudes toward the role of women in society. Nora, in A Doll’s House, represents the appearance of the modern woman. She is independent and curious, and she expresses a passion and a political consciousness beyond that being imposed by the patriarchal social order. Those changes in the balance of power, and the new perspectives they brought about, were part of even larger changes sweeping much of Europe. Malone points out Ibsen’s role as one of the messengers bringing news of these transformations to Ireland. In reading Malone’s scholarly work, it’s hard not to imagine that she started with a fixed idea and used all the research materials she could find to prove that idea. The result is a book that gives a pinhole view of its subject. Much can be seen through a pinhole, but the overall scope is limited. One can imagine the grunts of assent and grumbles of dissent from a very small circle of literary historians whose interests lie along the same narrow path. Her book will more than likely live a long and happy life in the footnotes of hundreds of academic researchers and thesis writers to come. Reviewer Martin A. David is a published author, playwright, actor, and theatre director.